Background: Natural orifice transluminal endoscopic surgery (NOTES) has been proven to be technically feasible in animal models but still has significant limitations for human application. Single-access transabdominal surgery is a competing alternative which obviates the need for multiple incisions. Looking to minimize the operative trauma and following NOTES principles, we used the umbilicus, an existing natural scar, as the sole abdominal entry site to perform laparoscopic appendectomy. Methods and Surgical Technique: We performed laparoscopic transumbilical appendectomy in seven (7) patients with uncomplicated appendicitis. Patients with appendicular mass or abcess were excluded. Three 5mm laparoscopic trocars were placed within the umbilicus with a bridge of fascia between them. A 5mm 30 degree angle laparoscopic camera was placed for visualization through one port. A rigid grasper was placed from the other port to manipulate the appendix. The appendiceal mesentery was ligated with ultrasonic scissors. The base of the appendix was ligated with endo-loops. Once the dissection was completed, the appendix was removed from the umbilicus and the umbilicus reconstructed. Results: Seven patients (2 male, 5 female) with a mean age of 38 years (range 28-50) were included in this preliminary study. Mean operative time was 45 min (range 35-55). There were no conversions or postoperative complications. Mean hospital stay was 1.2 days. 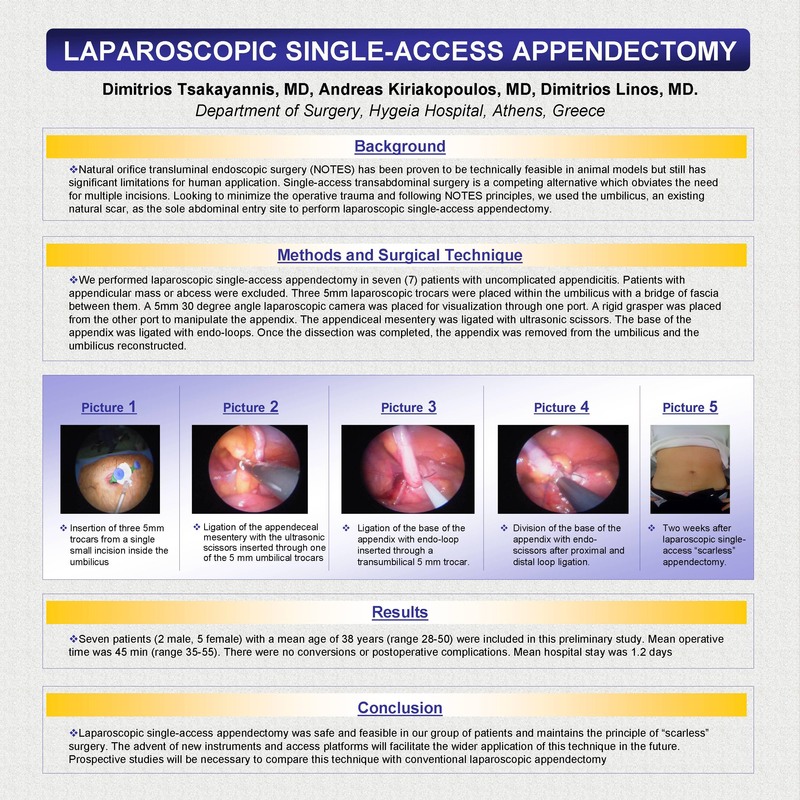 Conclusion: Laparoscopic single-access appendectomy was safe and feasible in our group of patients and maintains the principle of “scarless” surgery. The advent of new instruments and access platforms will facilitate the wider application of this technique in the future. Prospective studies will be necessary to compare this technique with conventional laparoscopic appendectomy.